Jimmy Cricket’s first play got a great reception from the audience on its debut performance – and was watched by a special guest. No more Fiffing and Faffing was staged for the first time at the Blackburn Empire Theatre on Sunday evening. Appearing with funnyman Jimmy was Jonathan Young from The Bachelors, and actor Colin Meredith, who has had several notable appearances in ITV’s Coronation Street over the years. Among the audience was Lady Anne Dodd, widow of famous comedian Sir Ken Dodd who died aged 90 in May this year. 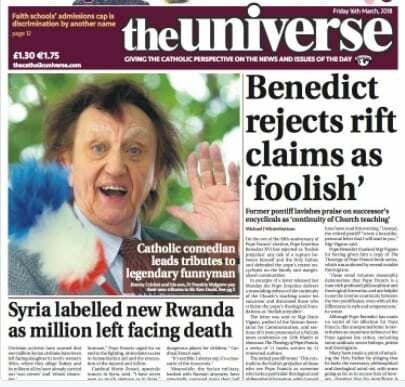 Fr Frankie Mulgrew, the younger son of famous entertainer Jimmy Cricket, has been discussing his latest book in The Universe, the Catholic national newspaper. The Roman Catholic priest, who is based in Blackburn, East Lancashire, compiled and edited Miracles R Us: Supernatural Miracles In The Catholic Church. A summary of the book, published by St Pauls Publishing, says: “Do miracles really happen? Are there miracles in the 21st century just as there were during the life of Jesus? “In Miracles R Us we discover how God works supernatural miracles in our day and age. Filled with real-life stories of spiritual and physical miracles from well-known priests, Religious and Catholic speakers we discover that life-changing miracles of the soul and physical healings beyond current medical explanation happen, all through the seven Sacraments of the Catholic Church: baptism, confession, Eucharist, confirmation, marriage, holy orders and anointing of the sick. It includes a contribution from Cardinal Vincent Nichols and all authorship profits will go to support Mary’s Meals, who provide vital meals to some of the world’s poorest children. 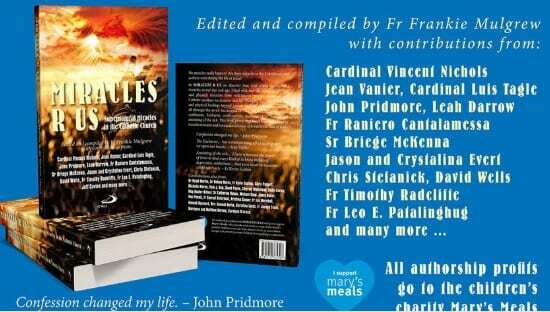 The 16 March edition of The Universe also features Fr Frankie talking about Miracles R Us. The comic-turned-priest, whose stage name was Frankie Doodle, has previously had a book published about God and humour called Does God LOL? (LOL is internet slang for Laugh Out Loud). 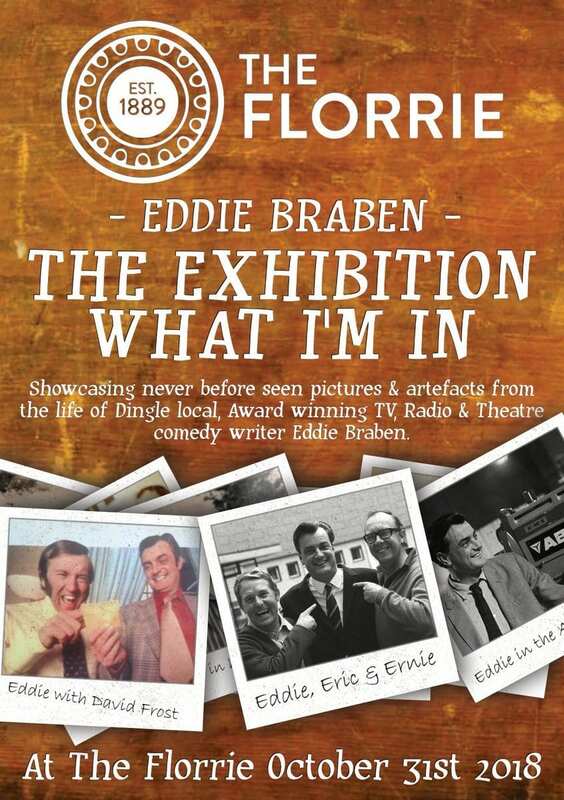 He compiled and edited the book, which includes contributions from famous entertainers Ricky Tomlinson, Tim Vine, Jo Brand, Milton Jones and the late Sir Ken Dodd and Frank Carson. All proceeds from sales of that book have also gone towards Mary’s Meals. 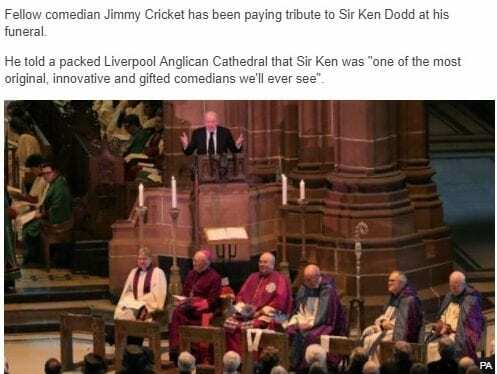 Jimmy Cricket was among those to pay a special tribute to the late Sir Ken Dodd at the legendary comedian’s funeral. The Northern Irish entertainer joined other stars like actors Ricky Tomlinson, Stephanie Cole and Miriam Margolyes, and fellow comics Jimmy Tarbuck and Stan Boardman at the service at Liverpool Anglican Cathedral on Wednesday. Sir Ken died at the age of 90 earlier this month. Jimmy said he was “one of the most original, innovative and gifted comedians we’ll ever see”. “Comedians like Ken only come once in a lifetime – we thank God today that he came in ours,” he told a packed congregation. Members of the public lined the route taken by Sir Ken’s funeral cortege from his Knotty Ash home to the cathedral in his home city. Some of them sang his 1964 song Happiness as the horse-drawn hearse passed. Tickling sticks were also placed around Liverpool in tribute to the famous entertainer who was loved by millions and whose shows would nearly always overrun, sometimes by hours. Jimmy Cricket has been remembering comedy friends Jim Bowen and Sir Ken Dodd, who died within a few days of each other. Liverpool legend Sir Ken, creator of the Diddy Men, passed away last weekend aged 90, having recently been released from hospital after six weeks of treatment for a chest infection. And broadcaster and comedian Jim, best known for hosting darts-based game show Bullseye in the 1980s and ’90s, died on Wednesday at the age of 80. 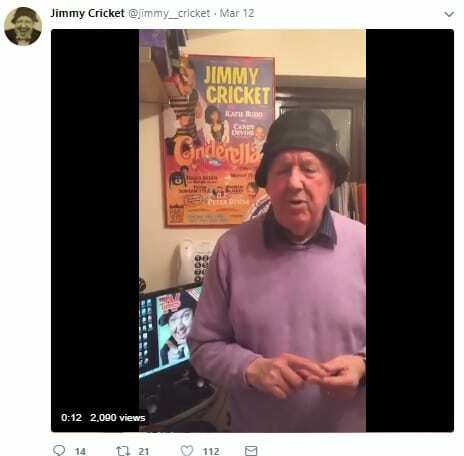 Belfast-born and Rochdale-based Jimmy posted a video on Twitter in which he pays a special tribute to Sir Ken (below). And the Rochdale Observer also reported on Jimmy paying tribute to Sir Ken. 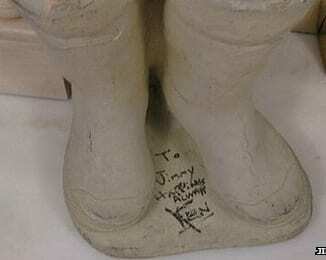 The story recalled the tale of the stolen concrete wellies – read more about that here. Read more about Sir Ken. Former deputy headmaster Jim, who lived in North Lancashire, began his career as a stand-up comedian on the club circuit in the 1960s. He became a household name when he began presenting Bullseye in 1981. The Sunday tea time show ran for 14 years. Click here to watch Jimmy’s appearance on Bullseye. 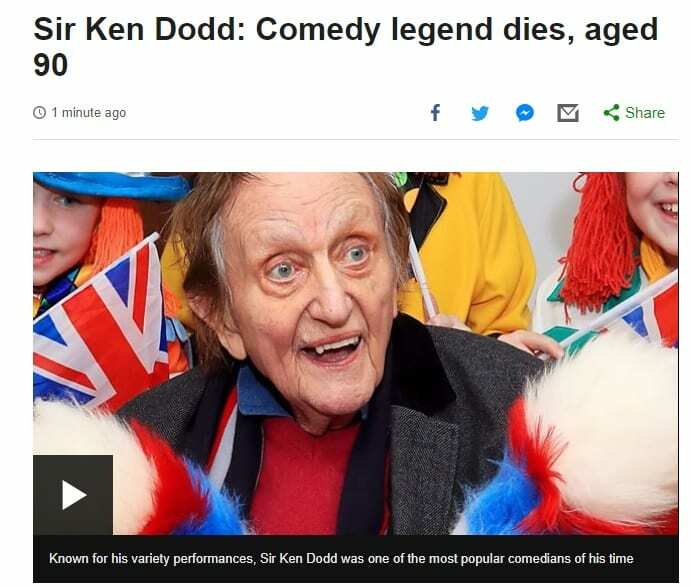 Jimmy Cricket was quick to pay tribute to his close friend and fellow comedian Sir Ken Dodd who has died aged 90. Liverpool legend Sir Ken, creator of the Diddy Men, had recently been released from hospital after six weeks of treatment for a chest infection. Only days before his death – which was announced this morning (Monday) – he married Anne Jones, his partner of 40 years, at their house in the Liverpool suburb of Knotty Ash. 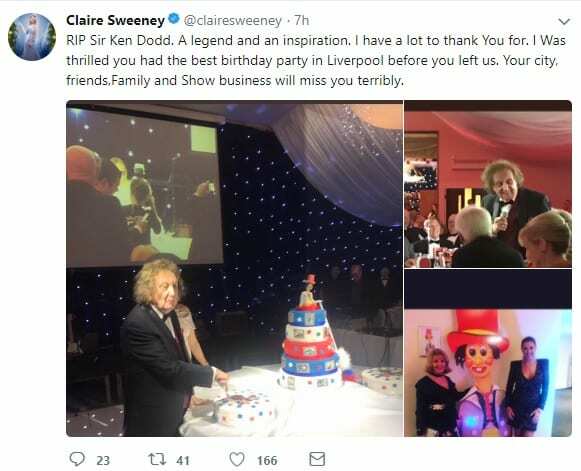 Actress and fellow Liverpudlian Claire Sweeney posted her own tribute on Twitter (below) and included photos from Sir Ken’s 90th birthday party in the city. Jimmy had been among those to pay tribute to his friend and fellow entertainer Sir Ken when he was honoured with a lifetime achievement award in October. 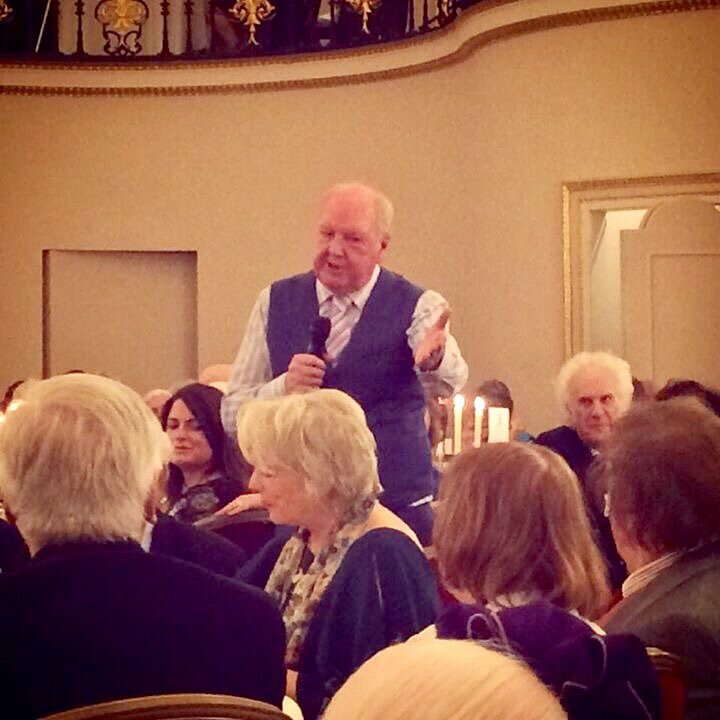 Sir Ken had received the accolade in front of a star-studded audience at the British Music Hall Society event at the Lansdowne Club in central London. He was famous for his very long stand-up shows, which sometimes lasted until the early hours of the morning, along with his Diddy Men from Knotty Ash and his tickling stick. The son of a coal merchant, Sir Ken had been a comedian since 1954 and made it into the Guinness Book of Records for telling 1,500 jokes in three-and-a-half hours. Sir Ken was also a ventriloquist and an established singer. He had many recording hits, charting on 18 occasions in the UK Top 40, and his version of Bill Anderson’s Happiness, which reached 31 in the charts in 1964, became his signature song. His recording of Tears topped the UK singles chart for five weeks in 1965, becoming the biggest hit single in Britain that year and selling more than a million copies in the UK alone, where it was the third best selling song of the 1960s and is the 39th top selling single of all time. Jimmy Cricket has expressed his delight at the news that close friend and fellow comedian Sir Ken Dodd has returned home after six weeks of treatment for a severe chest infection. 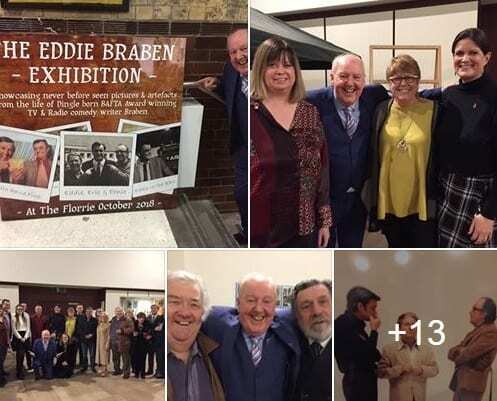 The 90-year-old funnyman, whose great career spans seven decades, was admitted to Liverpool Heart and Chest Hospital on 12 January, but left on Tuesday surrounded by his Diddymen. And Jimmy said on social media channel Twitter: “So good to see Sir Kenneth coming out of hospital yesterday with his Diddy Men by his side. Jimmy is pictured above paying tribute to Sir Ken (far right) when he was honoured with a lifetime achievement award last year. Wishing Sir Ken Dodd a happy 90th on Twitter! 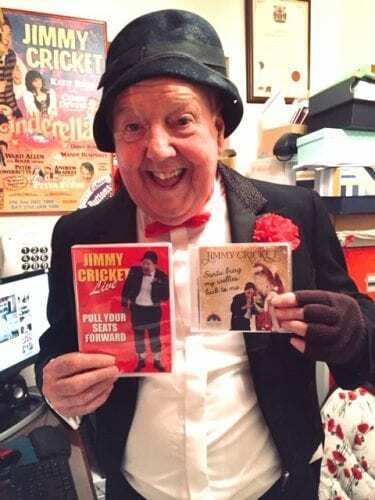 Jimmy Cricket used social media to wish his great friend Sir Ken Dodd a happy 90th birthday! Sir Ken is an English comedian, singer-songwriter and actor, particularly famous for his red, white and blue “tickling stick” and his upbeat greeting of “how tickled I am!”. He also created the Diddymen characters from Knotty Ash on Merseyside, where he is a local resident. 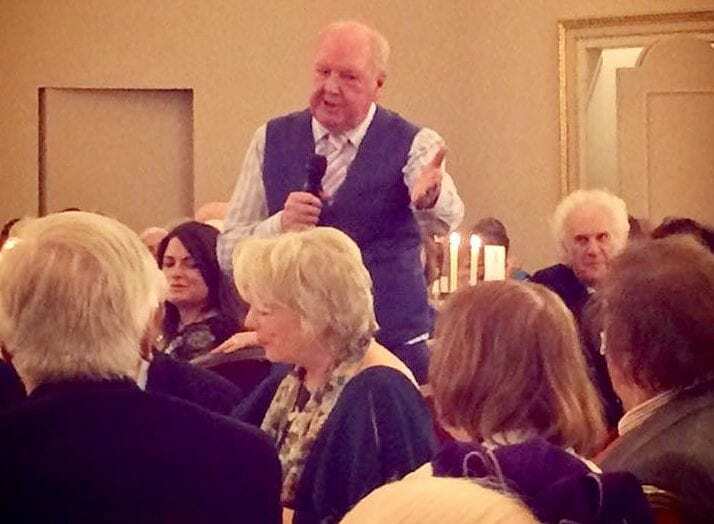 Jimmy, 72, was also among those to pay tribute to Sir Ken when he was honoured with a lifetime achievement award in front of a star-studded audience at the British Music Hall Society event at the Lansdowne Club in central London recently. 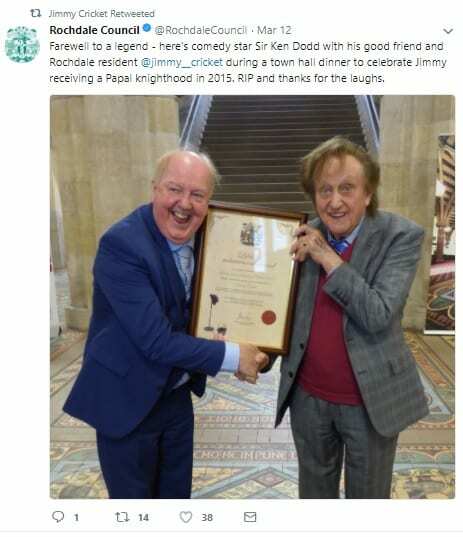 Jimmy Cricket was among those to pay tribute to his friend and fellow entertainer Sir Ken Dodd who was honoured with a lifetime achievement award recently. The recently knighted singer, comedian and actor will celebrate his 90th birthday on 8 November and Sir Ken continues to tour in an astonishing career which has spanned more than seven decades. He received his award in front of a star-studded audience at the British Music Hall Society event at the Lansdowne Club in central London. Had a wonderful afternoon with old friends @musichallsoc honouring the nation’s favourite Sir Ken Dodd at the Lansdowne in Mayfair London!